But first, thanks to our fabulous leader Rochelle for herding us week after week and for this week’s photo! Join in by clicking on the blue frog. Remember 100 words or less (not including the title), that’s all you need to know! Today is the day she puts Marie Kondo’s words to the test. Jennifer McCartney’s way had gotten her nowhere. Yes, McCartney’s book was a spoof of Kondo’s, she knew that. It was hilarious. Her house was NOT a total disaster of stuff. Everything was important. She needed her stuff. Really. Yes. Hold lonely slipper – I’m sure the other one is in the house somewhere – thank it for its service, then decide… keep it? Or chuck it? But what if she found the other one? Then what? This was so stupid. Time to call a professional de-clutterer. She obviously needed one. This entry was posted in Friday Fictioneers, fun stuff, humour, Writing and tagged Clutter, de-cluttering, Jennifer McCartney, Marie Kondo, Rochelle Wisoff-Fields. Bookmark the permalink. When I was a teen, my table used to be cluttered with my books, papers and what not! My mom used to bug me to clean and I used to consistently rebuff her saying only graves would be as clean as you expect. Now, after 20 years, I don’t know whether to laugh or cry whenever a vein pops in my forehead on seeing a cluttered shelf or table at home or office. Though I haven’t read, nay heard, of those two books I can safely say I’m well on my way reaching Kondo-land from McCartney-ville. I do have an ace up my sleeve, or rather, by my side. My new beau LOVES cleaning and clearing out stuff. He’ll definitely be the neutral element I need! I can tell you François (my new beau) is the perfect one to get me to chuck, chuck, chuck!! As for myself re Black Friday. It’s a good day to write and read. Shop? No way! No how! Oh…now that I’ve made it all about me, I so related to your MC. Hold lonely slipper…LOL Love it. Great little story – well done! I always preferred a cluttered mind to an empty one… maybe it’s the same with a house. So do I, Iain, so do I… they say it’s a sign of intelligence so I’m keeping that as my excuse! We spent many hours going through an aunt’s house. I will it was as neat as the closet in the picture! Cheers to decluttering! I have to go through my mother-in-laws apartment which makes that closet look perfectly neat. Yes, I will be eating turkey tomorrow, thank you very much. Yes, I will avoid Black Friday and other shopping like a handful of plutonium, mainly because I hate crowds but also because I don’t celebrate Christmas (my wife is Jewish). Well I do hope you enjoy it, James! The Jews celebrate Hannukah – another reason for gifts… but I’m with you, tomorrow is NOT the day to shop for me! Chanukkah (the spelling in English is a transliteration, so it is a little fluid) is a minor holiday on the Jewish calendar and I think only gets as much attention as it does because of the influence of Christmas socially. Gift giving isn’t really a big deal, since if they’re given at all, they are small. It’s more about the miracle of the lights as commemorated by lighting the menorah for eight nights. Plus the tradition is to eat lots of foods fried in oil. Yum. The McCartney one is a hoot and a half (‘course, she is Canadian). We are professional clutterers – and certifiable, I should think! Tell me about it. I have scraps of material for my eventual quilt – I can’t even sew – that my slew of how-to books will tell me how… along with ribbon embroidery, other types of embroider (I do, actually, needlepoint), knit… I think you get the point! Haha! Beautifully constructed, Dale. Being tidy takes a certain single-minded ruthlessness…which I’m happy to lack! Sounds like your heroine lacks it too. Lol. I kind of like her .🙂 Great story and relatable too. Professional de-clutterer sounds like a charming temporary option till stuffs pile up and scatter again, that is. I’m wondering whether that ‘Jennifer McCartney’ is the pen-name for my husband. Maybe I should organise him a visit from a professional declutterer for Christmas. Nicely done, Dale. No Black Friday madness, no clutter, everything is nice and tidy, just as my OCD demands. 🙂 Loved it, Dale! Excellent piece. Moving myself from city to city four times and intra city once in twenty-two years cured me of clutter. I feel purged. I so need a professional purger! Actually, my new boyfriend is an excellent one. This house will be ready for sale come end of February for sure! I managed to shift a lot of my sh*t by moving abroad in 2000 and back again in 2015. Packing concentrates the mind wonderfully. Moving does help one get rid of one’s sh*t indeed. Lord knows how much manages to accumulate…. sigh. Messing up the place takes skill, time and patience. Only solution is not those how to books, but a de-clutter whisperer. Straightforward and enjoyable to read, Dale. Who needs clever prose, cleverly disguised?! 😇 Loved your intro, too, as much as your story. The tale of the lonely slipper. There’s a whole new story there! 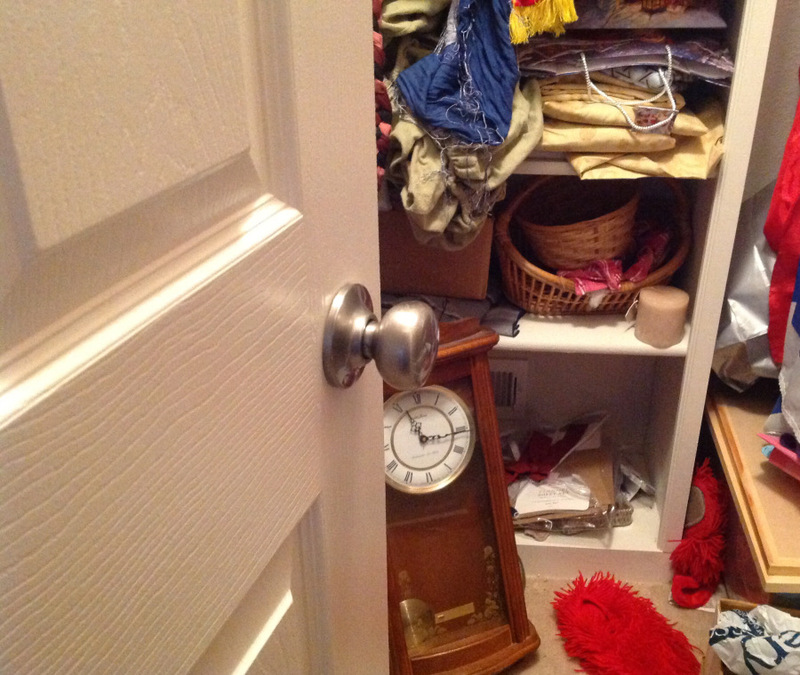 Your story reminds of the need to de-clutter my wardrobe – not a nice task. So do I… And my basement. And my kitchen. And my garage…. This was fun! (but I’m not the one who has to de-clutter). I married a man who is a total “Mr. O-C” (that’s what I call him). Obsessive compulsive about keeping a clean, clutter-free house. So everything is in its place here. And I must admit, it’s comforting. GOOD LUCK! I have met a man who is O-C… he will come in handy! Those books side by side were enough to make me laugh! 🙂 I feel a professional decluttered might be too ruthless for your character. Thanks for the book covers, I gel more with the second. Hahaha well it is the time of year to get new stuff… perhaps its time to make room? Keep the declutters out. They chuck everything. True. With nary a care! Once you’ve thrown everything out, you then have an excuse to buy them all back again. It is important to know some hoarders, they are the ones who always have a spare part that is not manufactured anymore. It’s probably cataloged and kept in a safe location too. My desk at work was always a mess. Now that I’m home everyday, my clutter fits right in with Connie’s. Those sound like very entertaining reads. Another good one in this vein is; HOUSEBROKEN, Admissions of an Untidy Life, by Laurie Notaro. You are a match made in clutter heaven… my.new guy is a neat freak… methinks as a result. My house will be ready for sale on time! I am surrounded by desk mess. My husband won’t touch a thing on it either. He says he might disrupt my order. I had heard of Marie Kondo’s book, but not Jennifer McCartney’s. Your funny story sums up the dilemma so many of us face! A slice of life! I feel this way all the time. I think I want to read McCarney’s book especially! It’s a hoot and a half! I haven’t read those 2 books but I imagine they’re a barrel of fun. I may have to gift them to my hubby. He thinks all floors are closets. I enjoyed your interpretation of the photo prompt especially the part about the professional de-clutterer. Your new beau will have the professionals skills …. it’s called ‘No sentimental attachment’ … therefore, gone. Have Happy Week … !!! 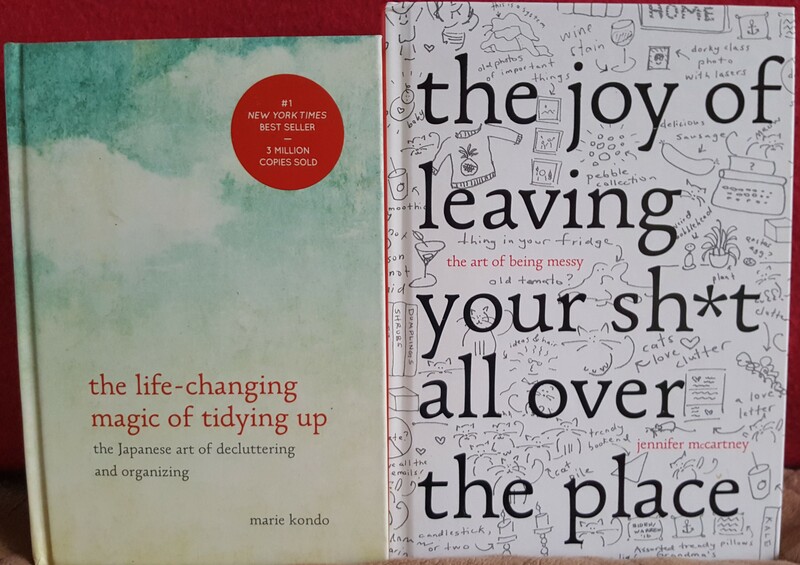 I haven’t heard of these books but I am def interested in de-cluttering, especially if I can get someone else to do it! That is the key, Dawn! Having someone else do It!! Same as mine. Man did the man keep stuff!